These words are extracts from the website of ‘Anarchists against the wall’, a group of Israelis who have made it their purpose to oppose the wall of separation (also known as wall of shame) being built around the occupied Palestinian territories. 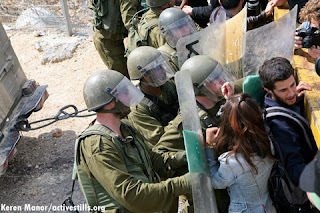 At a time when most of Israeli society appears at best ignorant of the plight it is imposing on other human beings, these men and women dedicate time and effort to raise awareness and engage in non-violent resistance against the same authorities that claim to act in their name and protect them against Arab barbarism. In their latest action it is reported that they plastered Tel Aviv and Jerusalem with posters denouncing the collective punishment imposed through blockade on the Gaza strip. فوجئ سكان تل أبيب والقدس الغربية المحتلة أمس بوجود بيانات ألصقها ناشطون من حركة «فوضويون ضد الجدار» على أبواب منازلهم تنبئهم بقطع التيار الكهربائي عن المدينتين أسوة باعتزام السلطات الإسرائيلية قطع الكهرباء عن قطاع غزة. وذكرت وسائل إعلام إسرائيلية أن قرابة 70 ناشطاً من حركة «الفوضويون» اليسارية علقوا نحو 10 آلاف بيان على أبواب المنازل والبنايات ولوحات الإعلانات العامة في تل أبيب والقدس الغربية. وأشارت إلى أن البيانات مشابهة للتي تصدر عن شركة الكهرباء الإسرائيلية لدى إعلانها قطع الكهرباء. وشدّد «الفوضويون» على أنه «لا توجد أي شرعية في العقاب الجماعي للمواطنين (في غزة)، حتى إن الجيش الإسرائيلي أكد أنه لا احتمال لأن تؤدي إلى وقف صواريخ القسام». وأضافوا أنه «بواسطة هذا النشاط، نحاول زيادة وعي المواطنين الإسرائيليين لعشوائية هذه الخطوات العدوانية ومحاولة حشد تعاطف مع ضائقة مواطني قطاع غزة». يذكر أن حركة «الفوضويون» هي أكثر الحركات الإسرائيلية التي تنشط ضد جدار الفصل في الضفة الغربية. The wall has accomplished one thing for both people which always seems to be overlooked. No more dead young suicide bombers and no more dead Israeli citizens, which many times have included Arabs. It is time to figure out inconvenience does not trump death. It is more than inconvenient. Waking up to a 5 m high wall in your backyard separating you from your land, from your family and from the world can only trigger anger and lead to violence. Not to mention that this wall is not IN Israel , it is built in the West Bank on stolen Palestinian land. Also it does not resolve anything in the long term, it complicates it. The Israelis are trying to redraw the map and acquire more land irreversibly before they have to sit and discuss any serious efforts to end the conflict. The only guarantee of security for the Israelis is a fair peace for the Palestinian. Anything else is delusional arrogance. I agree it is a great inconvenience, but it would not have occured if it were not for suicide bombings, which have ended from it's construction. While the inconvenienced are alive to work towards remedies the dead and their families have no remedy. I will not dispute more land is taken for a permanent border and am aware that Israel is about 12 miles wide from coast to West Bank. Is it just land grab or defensive measure from those who call for pushing Israel into the sea is the question. Perhaps the answer is both. I do know Israeli courts have made rulings where the barrier did have to be dismantled and moved. I think we both know that if it was taken down completely what would happen. A fair peace could take years when there are groups like Hamas dedicated to the destruction of Israel. Only Israel can decide how best to protect the lives of it's citizens and that is the first obligation of all nations. I wish things were as simple. The issue of security is not exclusive to Israelis. The Palestinians also have a right to a nation, to freedom from occupation and to security. This is the 'chicken and egg' situation that we find ourselves in whenever we have this kind of discussion. Who started? Us or them? Who has right to the land? I suspect no interpretation will satisfy both sides? The use of suicide bombers did not start in 1948, it came after successive failures of other strategies used by the Palestinians inclusing regular warfare and guerilla tactics. It is an act of desperation, also motivated by extreme ideologies, but it is hardly surprising when no serious efforts to provide a fair peace have been made. If the Israelis want security they need to realise that they are dealing with other human beings who have aspirations and a right to the pursuit of happiness. Not a mere nuiscence. In my humble opinion the Palestinian extremists will certainly loose the influence they have acquired over the years.